The Kardea Gourmet: Smart and Delicious Eating for a Healthy Heart is a combination of a nutrition guidebook and cookbook. It was created by Dr. Richard Collins, a cardiologist, Susan Buckley, a registered dietitian who is focused on heart healthy weight loss and Rob Leighton, self-described as a foodie with a cholesterol problem. The book was inspired by the author’s “love of food, desire to keep things natural, belief in science and passion for vital living”. It includes simple and flexible advice for heart healthy diet full of delicious eating designed to help you to improve your general health or to address specific issues such as high cholesterol, high blood pressure, glucose balance, inflammation and obesity. Kardea Gourmet commences by explaining the principles of cardiovascular health and assisting you to identify your risks. You will then learn methods by which you can effectively manage those risks, which largely involve dietary adjustment. A large amount of this heart healthy diet is dedicated to nutritional education with information about the good and bad fats and carbs, the role of vitamins and minerals and the potential benefits of nutritional supplements. The authors explore a variety of heart healthy approaches to eating including the Mediterranean diet, the Okinawan Diet, and low fat vegetarian diets. A specific diet for heart disease is not prescribed but instead you are given the opportunity to create a heart healthy way of eating that suits your lifestyle and preferences. It is not a requirement to become a vegetarian to follow this plan but it is recommended that meat intake is limited to a four-ounce portion at any meal. Sugar and desserts should be limited. A high consumption of fresh fruit and vegetables, whole grains and legumes is emphasized. At the end of The Kardea Gourmet is a selection of recipes categorized into sections including Gazpachos, Barley Pilaf/Barley Paella, French, Italian, Eastern Mediterranean, Moroccan and other selected recipes from the Kardea kitchen. Fruit, vegetables, oatmeal, brown rice, barley, whole grain bread, bran cereal, pasta, black beans, garbanzo beans, almonds, walnuts, fat free yogurt, eggs, seafood, lean meat and poultry, herbs and spices, coffee, tea, dark chocolate, red wine. 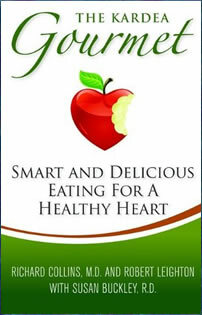 The Kardea Gourmet: Smart and Delicious Eating for a Healthy Heart retails at $24.99. Provides information and education about cardiovascular disease and a heart healthy diet. Encourages the intake of a variety of healthy foods including fresh fruit and vegetables, whole grains, legumes and nuts. May assist with the management of cardiovascular disease and diabetes. Appeals to those who enjoy eating food that is delicious as well as healthy. Does not contain clearly defined guidelines for a heart healthy diet. Does not contain a meal plan. No recipes are provided for breakfast or dessert. Many of the recipes contain meat and other animal products, which seems to contradict some of the concepts presented in the book. Does not include exercise guidelines. The Kardea Gourmet provides information about cardiovascular disease and educates readers so that they can create their own approach to a heart healthy diet. It also includes a selection of flavorful recipes. This book will appeal to readers who want to learn more about the connection between heart health and dietary intake. However those with serious health concerns may require a stricter and more clearly defined nutritional plan.